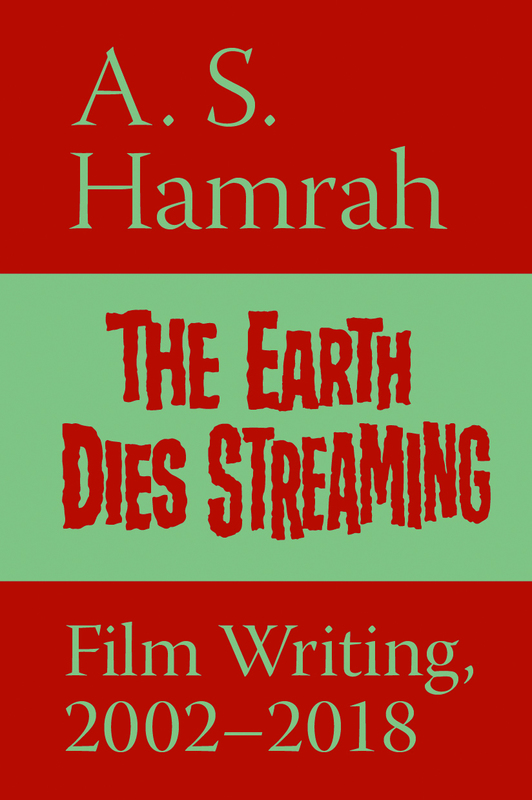 The Earth Dies Streaming: Film Writing, 2002–2018 by A. S. Hamrah. New York: n+1, 2018. 452 pp. Paperback: $20.00. What should be included in a film review? Surely the plot is important; it’s what separates Ocean’s 11 from, say, Ocean’s 12. Characters, too. How else will the reader ready up their relatability index before rushing off to see a paint-by-numbers biopic? And, surely, whether or not the film is crap. If it’s crap, we don’t want to see it. Nobody likes a crap film, and if they do, well, they’re wrong. Wrong is a very bad thing to be. A. S. Hamrah notes in the Introduction of his collection of film writing, The Earth Dies Streaming, that each of those elements can work very, very well for the more cynical elements of the film industry. Plot descriptions can be zany or thrilling and can sell. Character descriptions can announce the film’s cultural relevance, which can up its cultural currency so it can sell. And if you believe the film’s crap, well, that’s just your opinion: who needs critics, anyway? But, if you believe the film’s great, here’s your name on our poster, egghead. We hope you’ll give us another quote. So, Hamrah says, reviews are best avoided, lest you start working for a public relations firm instead of an independent publication. Practicing what he preaches, Hamrah’s criticism in this volume is terse, honest, funny, and usually not filled with rote plot descriptions—even if the reader sometimes does need to know what those films with one-word titles (Room, Flight, Creed) are about. Hamrah usually writes for the magazine n+1, which styles itself this generation’s “little magazine” à la Partisan Review or, more recently, The Baffler. His dispatches come in the form of capsule reviews of the films that have been released since the last issue. Since n+1 is a quarterly, this means that Hamrah can also include snapshots of moviegoing culture, which demonstrates that no film exists in a vacuum. In fact, the films often talk to each other in a typical Hamrah piece. In his Oscar film coverage of 2017 (“One Word: Authenticity!”), Hamrah notes that three high-profile, big budget films take place in what has become the Hollywood villain/research-subject of Virginia as cheap stand-in for “Trump country;” The Lobster is the fourth art-house film in the past five years to deal with organ harvesting and the made-for-best-costume caper Nice Guys somehow comes into contact with the installation-like slowness of Cemetery of Splendor. In his review of Jonathan Rosenbaum’s book Goodbye Cinema, Hello Cinephilia, Hamrah admires Rosenbaum’s essay on John Ford’s The Sun Shines Bright for “how autobiography leads him to connect Ford’s film to an unexpected series of other films—Pickup on South Street, Stars in My Crown, Gertrud, and Playtime—taking him on tangents that broaden and deepen understanding of The Sun Shines Bright, and Ford in general, in remarkable ways.” Hamrah takes that admirable skill and often makes it his own. Shane Black's The Nice Guys. Apichatpong Weerasethakul's Cemetery of Splendour. In fact, Hamrah’s little stories about going to see or not see certain films sometimes get to the core of a movie better than the standard write-up. A review of Hotel Artemis early in the book offers no plot description or character analysis or anything about the movie at all. In fact, he never saw it. But he does note that one night the lobby of the Quad Cinema in Manhattan was swarming with industry subordinates, cameras, starfuckers, and Paul-Blartish rent-a-cops. They all represented some preternatural force of unadulterated industry buzz called Hotel Artemis, which Hamrah, thanks to his experience with them, will not see. He was trying to see a print of Jean Cocteau’s Les Parents terribles, which, gauging from his review that sits on the same page as the Hotel Artemis nonreview, was not even that great. A second little story comes halfway through, in a review of Life of Pi, in which Hamrah turns around and exits the theater upon learning that he was forbidden to bring his large coffee into the theater, even if he had forked over $18.50 for 3-D tiger action. He decides to go to the Strand Bookstore instead, and he buys a book with a tiger on the cover. It’s much cheaper than the movie. This incident highlights a particular bugbear in the filmgoing community: the walkout. To some, the walkout is the mark of a critic who is “too good” for the film; to Hamrah, it’s opportunity cost. And a smart film critic knows when a film just isn’t worth a nice day in the city. That’s honest. And good on n+1 for publishing the sort of nonreview that ends up a lot more memorable than what’s stamped on the Life of Pi Blu-ray cover (“The next Avatar. A visual miracle,” a snippy ad-language reimagining of Richard Corliss’s Time review.) In fact, A. S. Hamrah is quick to open up about the industry, his publishers, and himself. Film critics often dive straight into a five-hundred word review without taking the time to mention how those words got on the page. But, as a young critic, I often wondered: was this review written in a noisy but comfortable Washington Post office, a Los Angeles coffee shop, a Brooklyn brownstone? Hamrah reveals that—surprise, surprise—being a film critic is not how he makes rent, and getting those reviews in on time is tough. He took Chantal Akerman to a cheap Vietnamese restaurant when he lived in Boston. He literally phoned in an Oscar roundup on deadline when waiting for a subway. Many film critics talk about not having money, but not many talk about not having its proverbial equivalent—time. I’m writing this review near deadline during my holiday break from teaching. There was no reasonable way I could have written it before. But writing about that economic reality never comes across as a pity party in Hamrah’s writing—only a stone-faced admission of why most film writing is just plain garbage. The one-and-a-half-job freelancer has no time to research, no time to edit the fourth draft. And, Jesus, those Marvel Comics movies are all two-and-a-half hours long nowadays. Hamrah transfers that frustration into a keen analysis of money on and off screen. In his Trump report, it’s the Freedom Kids who “had to sue the Trump campaign for the money they lost when they were not allowed to sell CDs at their performance.” In Ex Machina, “The unavoidable onslaught of virtual reality and artificial intelligence will make stories like this ever more relatable to lonely techies in search of mechanical love in robot form, but not me. There’s not even room in my apartment for a vacuum cleaner.” In a review of Personal Shopper: “All the other Americans in it seem like extras in Silicon Valley, and the Europeans merely members of the international creative class, stylish people with enough time on their hands to have affairs, but not enough to do their own shopping or chase their own ghosts.” In “Film-Like,” he laments that writing under publicist embargo, film critics “are not only forced to work for [producers] by writing promotion for their films in the form of reviews, but by following their instructions to the letter about when they are allowed to publish—in essence, about when they are allowed to speak.” And, in a long piece about “Painter of Light” Thomas Kinkade, Hamrah takes a break from reviewing the straight-to-DVD curio The Christmas Cottage to evaluate the price of housing in Kinkade’s town: twelve months interest-free—$0 down—fifteen-minute approval, signaling a deal that could only land a buyer in debt. Thomas Kinkade’s straight-to-DVD The Christmas Cottage, with Peter O’Toole and Jared Padalecki. That Kinkade piece, written in 2009 with a postscript from 2014, is my favorite from The Earth Dies Streaming. It’s barely about film, and it’s not his typical n+1 capsule coverage, which may sound like I don’t care for Hamrah’s usual fare. Not true. But the Kinkade piece shows off Hamrah’s reporting chops as he digs into the Painter of Light’s life only to find darkness and an FBI investigation. He exposes the saccharine spiel of The Christmas Cottage, connects Kinkade’s paintings’ warm interior lights to the perpetually aflame horror house of Synecdoche, New York, and pokes holes in his legacy with on-the-ground reporting of the Kinkadian Neverland of Hiddenbrooke—where the houses have no people in them, just like Kinkade’s paintings. It’s political without being opportunistic or banal, and it’s deep reporting on a subject Hamrah obviously doesn’t like but without any hand-waving dismissal. Much of the piece is simply a detailing of numbers: how much a painting or a house cost a few years back and how much it sold for the other day. Both the Kinkadian houses and Kinkade’s paintings seem to depreciate as the PR veneer deteriorates into reality. That piece connects a straight-to-DVD mistake you’ll likely never see to an economic reality that your rent payments force you to see. It’s much better than, say, his Trump reportage in “Heads without Bodies,”which merely suffers from being written in 2017. Certain comparisons work, like, “The studios have the same relationship to the press as Donald Trump. It’s love or nothing, and anything less is treason.” Others, like the comparison of Dale Cooper in Twin Peaks: The Return to James Comey and the White House to the Black Lodge, feel forced, as these sorts of digs at Trump only boil down to, per some prominent Internet memes, “Orange man bad.” All left-liberal culture writing looked like this in 2017 and most of 2018, so, while it’s forgivable, the words are still dead on the page. Regardless, at its best, The Earth Dies Streaming feels like it’s from another era. It feels like Rosenbaum at The Chicago Reader with sometimes even more punch. Hamrah writes about Steven Spielberg buying a Rosebud sled for sixty grand only to deny Orson Welles a job in his Amazing Stories series, driving home both of their legacies in two sentences. On The Revenant: “One thing is certain: Iñárritu has finally solved the problem of how to film a realistic bear fight. The next cinematic problem he should tackle is screenwriting.” On The Big Short: “The performances in The Big Short are carried by wigs, makeup, and bad suits, like in a silent comedy.” He notes that Ryan Gosling’s holographic girlfriend in Blade Runner 2049 removes her clothes only to taunt him and the film’s audience of “fanboys and tenured professors.” His punchy observations can also prompt sympathy as he reveals that Adam Driver’s Kylo Ren dons his mask in Star Wars: The Force Awakens not because he is mangled, but because he is young. Another sign of a smart critic is that their mere description can offer another distinct, edifying lens to a work.